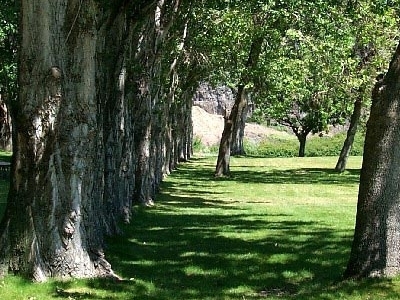 Columbia Hills State Park (which includes the Horsethief Lake area and Dalles Mountain Ranch area) is a 3,338-acre camping park with 7,500 feet of freshwater Shoreline on the Columbia River. Horsethief Butte dominates the skyline. It stands over the lake like an ancient castle. The lake itself is about 90 acres in size and is actually an impoundment of the Columbia River. The lake was flooded into existence by the reservoir created by The Dalles Dam. The park has eight partial utility sites, four standard sites, six primitive tent sites, one dump station and one restroom.Lupine and balsam root bloom in mid-April making spectacular fields of purple and gold. Rock climbing is possible in this park.Large shady, grassy lawns are suitable for croquet, soccer, etc. Visitors must bring their own equipment. No horseshoes are provided for the horseshoe pits. Here's the our members favorite photos of "State Parks in Washington". Upload your photo of Columbia Hills State Park!